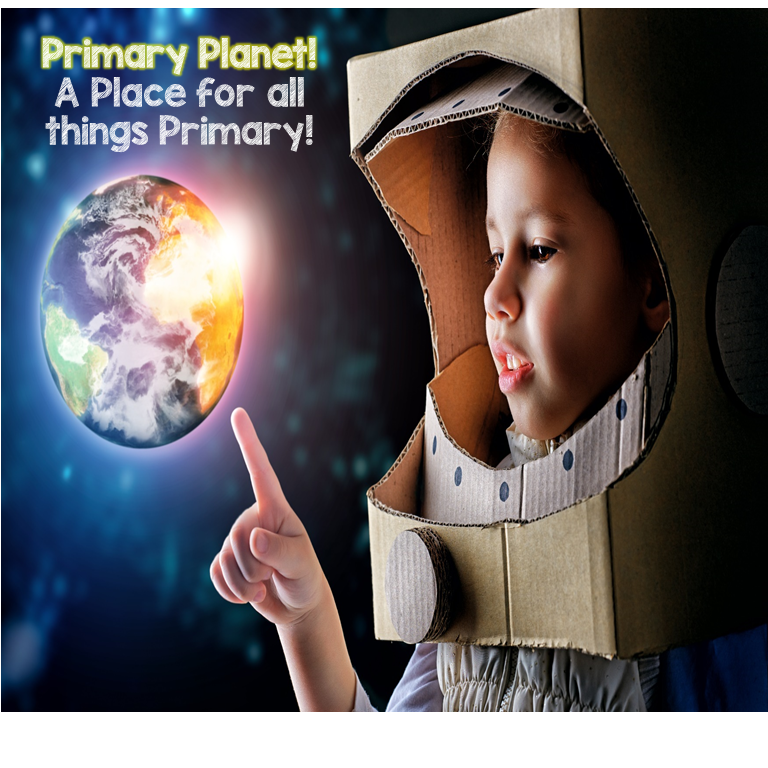 Thinking About Math | Primary Planet! Math has never been my strong point, but I know how important math is, so I am working on it! This year I have started (a few days a week) to do some Guided Math groups. I had been reading about how others do Guided Math and it only makes sense. So, here is what I have come up with. In our building we use Every Day Math. So, I have 3 groups that rotate through 3 activities. Meet with Me, Paperwork at their seats, and Math Games. I have a board set up to show where each group goes. Before we start a new Unit, I give the kiddos a pre-test. This is how I determine my groups and what I really need to focus on for the whole class. So the groups change depending on what I am trying to accomplish. ﻿ I start math time with the whole group lesson from EDM. Then, we split off into our groups. I have 3, the Robots, the Aliens, and the Martians (goes with my space theme). This is a picture. 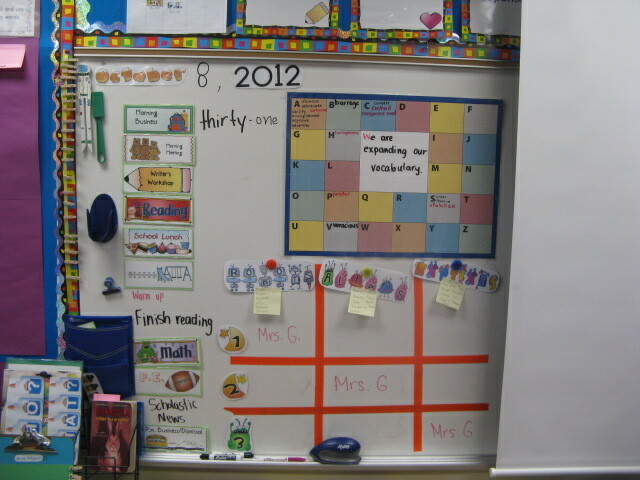 The orange grid is where I write in what each group is working on for each round. While the kiddos are working with me, I try to tailor my lessons to fit their needs. 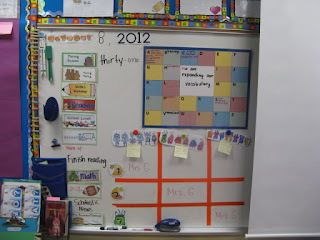 For the highest group, we usually do some sort of brain teaser or Marcy Cook tiling activity. (If you haven't heard of Marcy Cook, she is amazing! If you click on her name, it will take you to her site. I have been to several of her workshops. They are fun and enlightening! I would highly suggest them if you ever get a chance to go!) I try to do some tiling activities with the middle and lower groups as well, just more tailored for their needs. While they are working on "Paperwork" they do the math boxes page for the day, then work on Accelerated Math. If they are having difficulty, they come and sit down near the area where I work with small groups, then if my group is working independently or with a partner, I can look in on what those kiddos need as well. The games are all from EDM and we have played them together in class, so they are very familiar with that process. Sometimes I have a parent helper who goes around to work with the groups that I am not with. At the end, we come back together as a class to go over the math boxes page or to talk about how things went for that session. 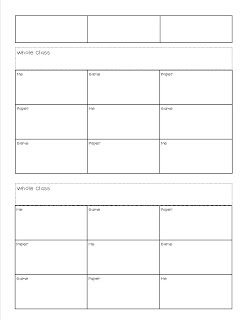 This is the planning sheet that I use. 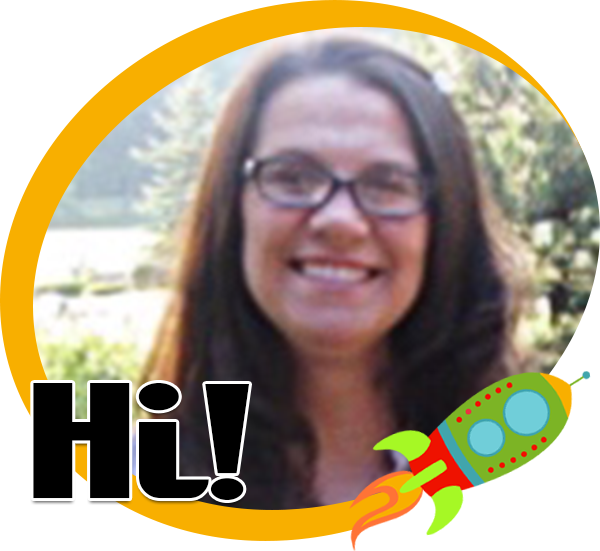 Do you do Guided Math or Math Groups? What works for you?